A little over a year ago, Montreal Canadiens’ defenceman and alternate captain P.K. Subban was days away from his No Movement Clause kicking in, a clause that would have kept him Quebec until at least 2022. On June 29th, two days before the NMC took effect, he was traded to the Nashville Predators for defenseman Shea Weber. At the time debate raged about which team did better from what seemed like a fairly even trade. The Habs casually mentioned that Subban was a ‘headache in the locker room’, while questions were asked about Weber’s fitness and longevity. Comparisons to Chris Pronger were made. That was a year ago. Let’s see what the picture looks like now. The Canadiens, who’d failed to qualify for the playoffs one season prior, clinched the Atlantic Division with ease. Unfortunately for Montreal, the team was drawn against the Stanley Cup’s perpetual runners-up; the New York Rangers in the first round. The Habs’ cup dreams were crushed in six games and the Rangers advanced. Weber played his part, scoring one goal and assisting on two others. P.K. Subban’s Nashville Predators fared much better. The team made franchise history by reaching the Conference finals and then the Stanley Cup final. 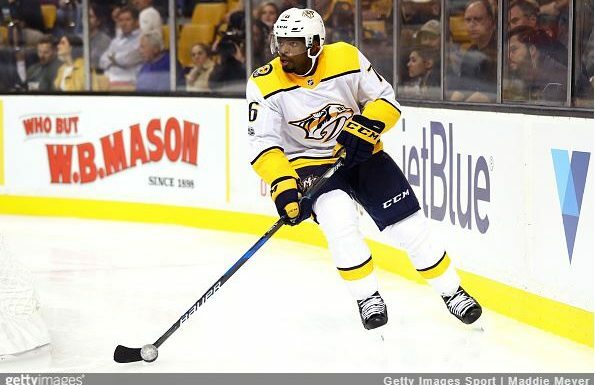 Subban himself scored 12 points (two goals and ten assists). In the first round Nashville thumped the Chicago Blackhawks, including two shutouts. In the short term, the Predators definitely got the better deal. Predicting the long term prospects for both of these teams is tricky. Weber is 31 and is about the start the sixth year of a 14 year contract. The Habs’ old guard is getting older, and unless some big trades are made; the Stanley Cup window is closing. Weber doesn’t have more than three of four more good seasons left in him at the most. Subban however is three years younger and the 40 regular season points he tallied this past season was his lowest since 2012/13. It could be that he’s just settling in to a new team. He also missed some games. The Nashville faithful have definitely accepted him as a Predator though. If playing the long-game then Subban; on paper at least, has longevity on his side. Thanks to Weber’s small sample size in the playoffs compared to Subban’s, there’s no value in looking at the postseason so we’ll focus on the regular season. I’ve added Norris Trophy winner Brent Burns for comparison. You said that the Predators won this trade, and although it’s too early in the new season to tell definitively; you’re probably right. The Preds aren’t exactly dominating the Western Conference, but the Habs look miserable. Subban has definitely made an early impact. Where do you stand on Subban/Weber? Comment below or join in the conversation on twitter. Next Post: How Much Trouble Are The Canadiens Actually In?